This week, the World Resources Institute (WRI) released a report titled, Including the Excluded: Supporting Informal Workers for More Equal and Productive Cities in the Global South. Written in collaboration with WIEGO (Women in Informal Employment Globalizing and Organizing), the report presents the state of the informal economy in the global south. Notably, it focuses on cities in Asia and Africa and notes the need to support informal workers. (The ILO defines informal employment as employment without legal or social protection.) This post highlights two figures from the WRI report that show where African cities lie in terms of informal employment activities when compared to non-African ones. The report states that supporting informal workers is key to enhancing the productivity of cities in the global south, as informal enterprises generate 25 to 50 percent of value added outside of agricultural activities. The report states that most of the urban workforce in the global south is informal, ranging from approximately 52 percent in developing Asia to 76 percent in Africa, largely surpassing the world average of 44 percent. 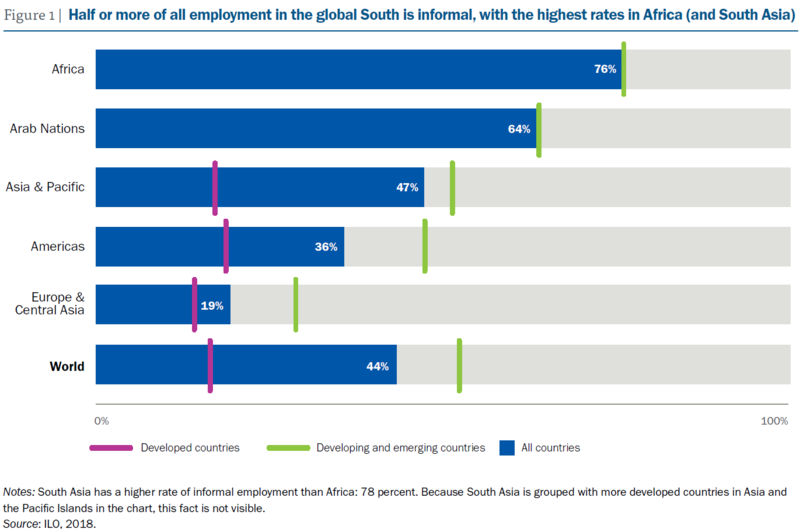 While the figure below shows that Africa has the highest rate of informal employment in cities, the report notes that South Asian countries have an urban informal employment rate of 78 percent, surpassing Africa’s rate. (This is not visible in Figure 1 as South Asian countries are grouped in the Asia and Pacific category). As the rate of informal employment varies within regions, so does the nature of informal jobs. Informal employment is often split between wage and self-employment. In sub-Saharan Africa, the latter prevails. The report also adds that Africa’s informal sector is largely made up of own-account workers—ones who do not hire others (e.g., street vendors)—thus questioning the sector’s ability to generate employment at a larger scale. Data on informal employment is rather scarce, especially at the city level. Nevertheless, the WRI report cites a survey by French research institute Développement, Institutions et Analyses de Long terme (DIAL), done in collaboration with national statistical offices, analyzing the scope of informal employment in certain cities in the global south. According to Figure 2, compared to other cities in the global south, on average, African cities have a higher prevalence of informal employment, as seen in the cases of Kampala and Dakar, for example, where the informal sector employs 86 and 80 percent of workers, respectively. 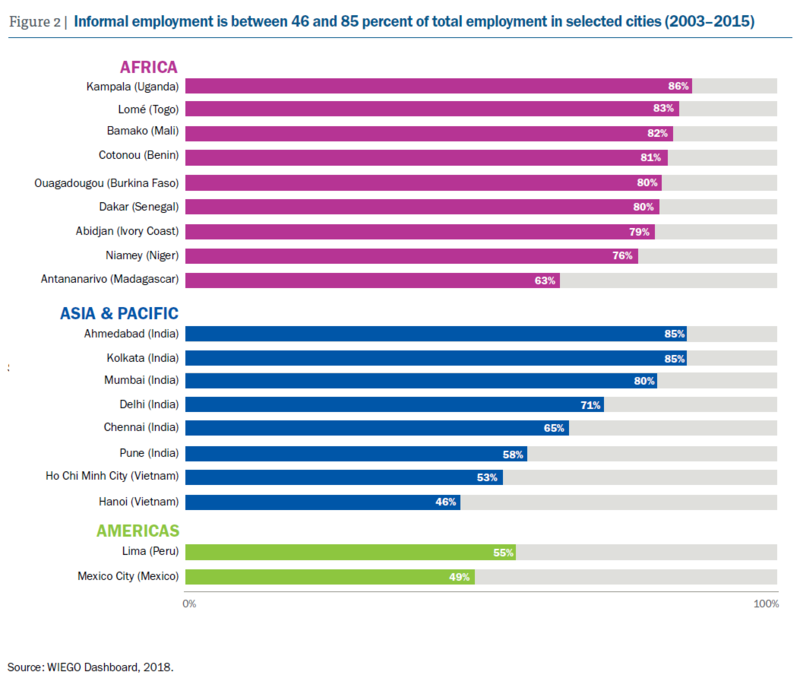 According to the report, informal employment in African cities is the norm rather than the exception. To conclude, the informal sector employs a large share of workers in the global South, and this phenomenon is more acute in African cities. The report suggests that in order to support informal workers and create more productive cities, policymakers should increase informal workers’ access to public services and public spaces—e.g., avoid evictions. The report also suggests reforming laws and regulations in order to encourage informal workers to register their businesses and improve tax collection.